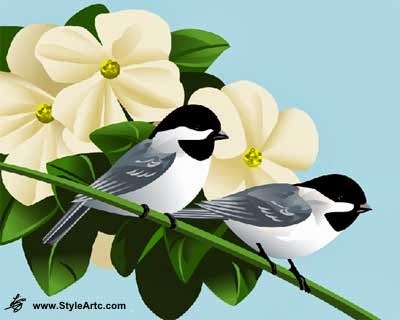 These Black Capped Chickadees is the first of my computer paintings that I have been redoing into vector format. Vector graphics are re-sizable allowing me to make the image as big as I want without loosing any quality in the picture.This is a huge advantage when preparing my artwork for sale on different merchandise. My goal is to produce more computer art with vector graphics software. I'm using one called Inkscape which I just love!